Browse Attractions and Activities for more articles like this. 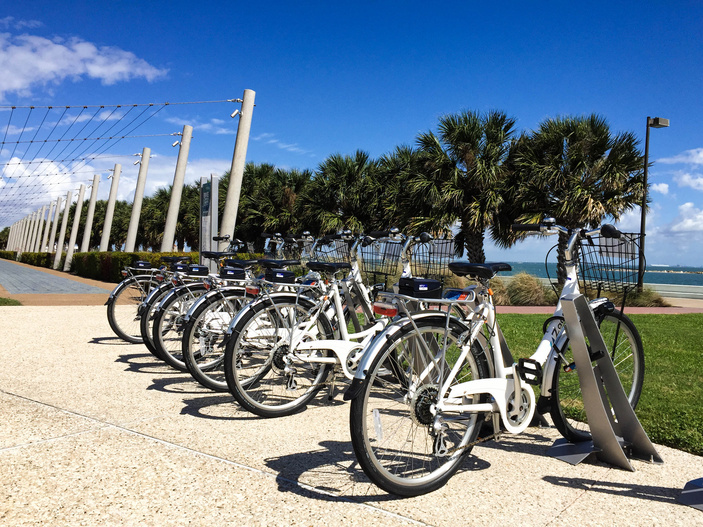 A new bike sharing program in downtown Corpus Christi just upped the fun factor for sightseeing along the seawall and Marina Arts District. Follow this reporter’s own personal discovery of the district’s museums, sculptures and culture — or lay out your own adventure. This route covered approximately 3 miles roundtrip and took about an hour to complete (not counting a stop for lunch). The bikes are a partnership between the Downtown Management District and a national bike share company. Zagster supplies 40 new bikes across seven locations downtown for a mere $3 an hour (first hour free!). Bike Corpus Christi is off to a great start according to recent statistics. More than 2,600 trips have been taken by more than 1,200 riders in the program’s first six weeks. The bikes are comfortable and easy to use. Each has a front basket big enough for a purse or backpack. They come equipped with a bell, front and rear lights and seven gears. A bike pump at the rack helps keep tires ready for a spin. Borrowing a bike for the day is easy: download the Zagster app on your smart phone and follow the simple instructions to unlock the bike. The bike comes with a U-Lock, so you can secure it at each of your stops. You have to provide your own helmet, which is always recommended for safety reasons. Helmets are not a requirement, however. Now, let’s go! This reporter hopped on board at the Zagster bike rack at North Bayfront Park near the new Visitors Center. As you ride along the seawall, take in the salty ocean air. You’ll have a nice breeze as you ride along. Our favorite sculpture in the whole downtown area is “Untitled History,” which is a 5-part sculpture series representing different parts of Texas history. You’ll find the first sculpture easily: it’s along the seawall near the Visitor’s Center. This piece is a dog looking up at what is supposed to be a person. The dog stares into empty space as only the feet are there. Other pieces of the whole are scattered about the S.E.A. (Sports - Entertainment - Art) District. A great bike share adventure would be to find and photograph the rest of the statue: the hand of a 16th century spaniard; the dress of an Irish immigrant from the 1820’s; a torso fragment of an African American cowboy; the helmet of an oil field worker from the 1930’s. Pedal north along the seawall towards the Art Museum of South Texas. You will catch a beautiful view of the U.S.S. Lexington aircraft carrier docked in Corpus Christi Bay just on the other side of the Harbor Bridge on North Beach. When you get to the art museum, you can lock up the bike and tour the exhibits, which are constantly changing and evolving. It’s also a great place to cool off on a hot day. Afterwards, ride toward the Water Gardens fountain to the left of the museum. Stay on the path for a fantastic circular ride around the pulsing waters. Check out the Six and Seven Flowers sculpture on your way out. You’ll find a lot to explore in this area, which is also home to the Corpus Christi Museum of Science and History, Whataburger Field (home of the Astro’s farm team, the Hooks) and Brewster Street Ice House. It’s up to you how much time you spend here. After looping around the Water Gardens, ride south on North Chaparral Street. If you feel comfortable riding in the street, you can do so; otherwise, Zagster instructions suggest sticking to the sidewalk. All along Chaparral Street stands a series of sculptures with fun names like Aztlan and Westfork. Stop at each one to get a full appreciation. Chaparral Street becomes one-way, so take a right on Belden Street, ride for one block, and take a left onto North Mesquite Street. You’ll pass a World War II memorial before riding through the most colorful section of the Marina Arts District. Electric boxes, walls and more otherwise bland objects have been turned into vibrant works of art reflecting the color, life and light of the Coastal Bend. The Executive Surf Club in Water Street Market makes for a great lunch stop. According to legend, the restaurant was founded when a group of local surfers started working 9-5. One of those surfers, Brad Lomax, became a restauranteur and opened the Executive Surf Club, complete with surfboard tables. In fact, Lomax developed the whole block into the Water Street Market Area, complete with the Executive Surf Club (home of the most draught beers in the city), Waterstreet Oyster Bar and Waterstreet Seafood Co. And that’s not all. After lunch, check out the Texas Surf Museum next door, where you’ll learn about the local surfing culture and how Water Street Market gives back to the community and the environment. The ride north along the seawall takes you back to the beginning of your trip, but don’t forget to stop at the Selena Memorial Statue in one of the eight miradores along the way. Miradores are gazebos built along the seawall to provide a shady, comfortable place to gaze out to sea. Called the Mirador de la Flor, Selena’s memorial is usually full of visitors leaving flowers and paying tribute to the Queen of Tejano. The mirador plays a sampling of Selena’s music throughout the day. When you’ve finished your trip, returning the bike is easy. Use the same code that you used to release the bike to lock it back up again, and then press the “end trip” button through the Zagster app. The bikes are a permanent addition to Corpus Christi, so you can go for a ride starting at any Zagster bike rack across seven locations downtown. Next time, plan your route to include a visit to the K Space Contemporary art museum, the historic 1920’s Ritz Theatre, public art such as the Loteria mural on Chaparral, and other restaurants like Brewster Street Ice House, House of Rock or even the original Whataburger.